Here is one of the largest objects that anyone will ever see on the sky. Each of these fuzzy blobs is a galaxy, together making up the Perseus Cluster, one of the closest clusters of galaxies. The cluster is seen through a foreground of faint stars in our own Milky Way Galaxy. Near the cluster center, roughly 250 million light-years away, is the cluster's dominant galaxy NGC 1275, seen above as a large galaxy on the image left. A prodigious source of x-rays and radio emission, NGC 1275 accretes matter as gas and galaxies fall into it. 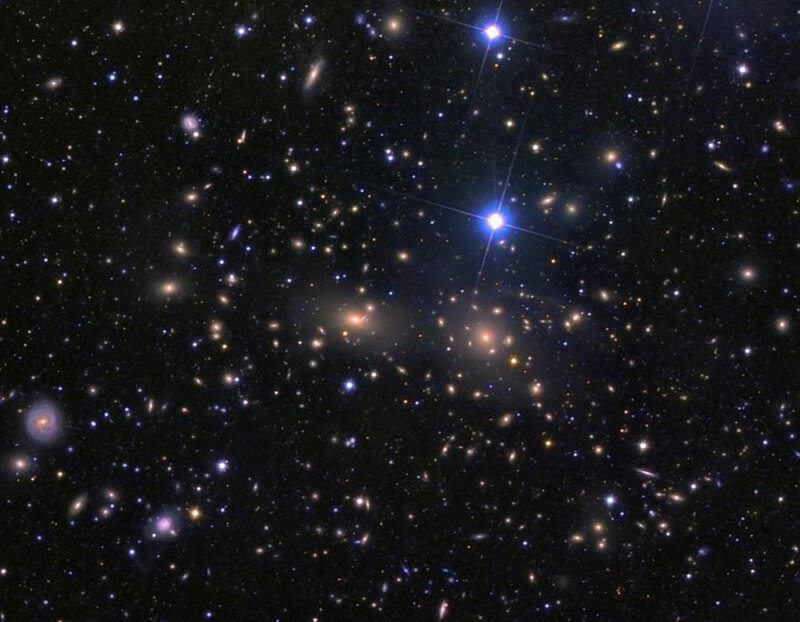 The Perseus Cluster of Galaxies, also cataloged as Abell 426, is part of the Pisces-Perseus supercluster spanning over 15 degrees and containing over 1,000 galaxies. At the distance of NGC 1275, this view covers about 15 million light-years. Why is this cluster of galaxies so jumbled? 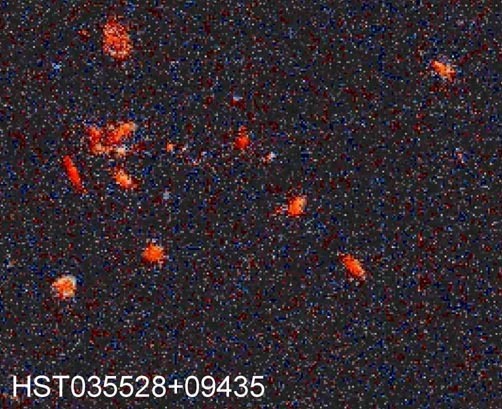 Far from a smooth distribution, Abell 2744 not only has knots of galaxies, but the X-ray emitting hot gas (colored red) in the cluster appears distributed differently than the dark matter. 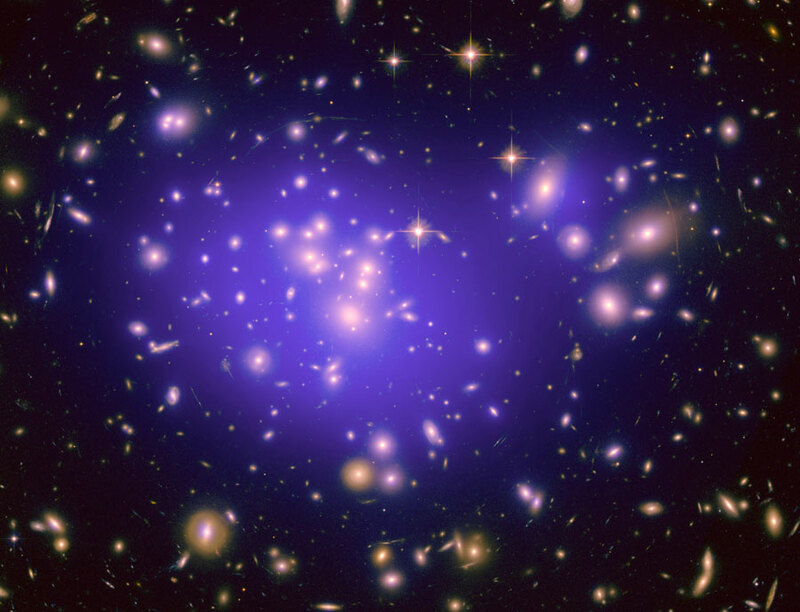 The dark matter, taking up over 75 percent of the cluster mass and colored blue in the above image, was inferred by that needed to create the distortion of background galaxies by gravitational lensing. The jumble appears to result from the slow motion collision of at least four smaller galaxy clusters over the past few billion years. The above picture combines optical images from the Hubble Space Telescope and the Very Large Telescope with X-ray images from the Chandra X-Ray Observatory. Abell 2744, dubbed Pandora's cluster, spans over two million light years and can best be seen with a really large telescope toward the constellation of the Sculptor. Why are there faint rings around this spiral galaxy? Possibly because the galaxy, NGC 4911, is being pulled at by its neighbors as it falls into the enormous Coma Cluster of Galaxies. 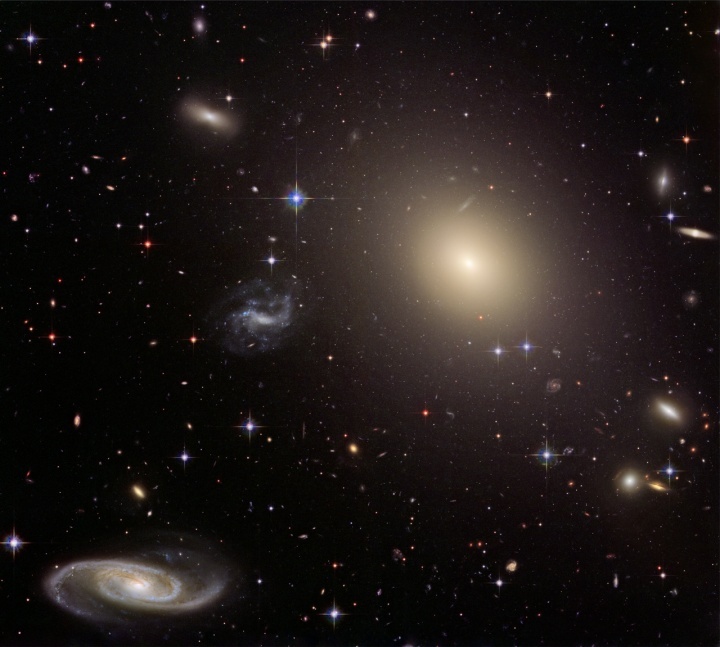 If NGC 4911 ends up like most of the galaxies in the central Coma cluster, it will become a yellowish elliptical galaxy, losing not only its outer layers, but dust, gas, and its cadre of surrounding satellite galaxies as well. Currently, however, this process is just beginning. Visible in the above deep image from the Hubble Space Telescope are NGC 4911's bright nucleus, distorted spiral arms laced with dark dust, clusters of recently formed stars, unusual faint outer rings, dwarf companion galaxies, and even faint globular clusters of stars. 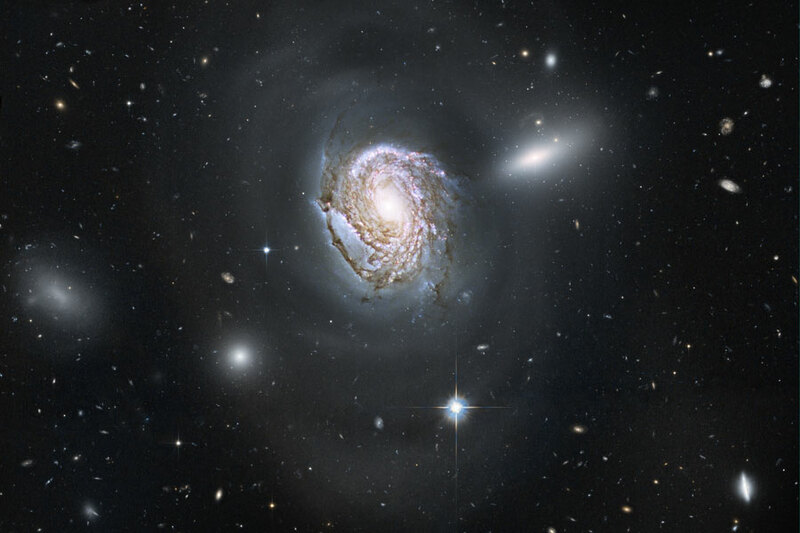 Far in the distance many unassociated galaxies from the early universe are visible, some even through NGC 4911 itself. 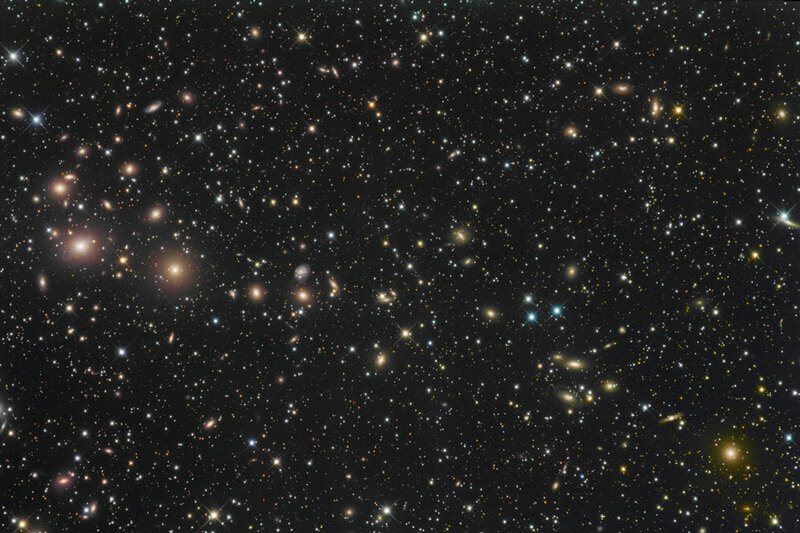 The Coma Cluster contains over 1,000 galaxies making it among the most massive objects known. 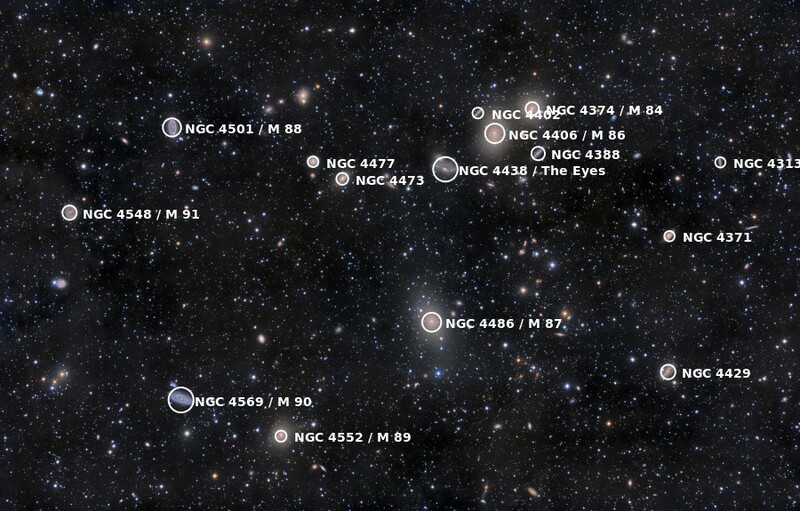 NGC 4911 can be found to the lower left of the great cluster's center. What if we could see back to the beginning of the universe? We can -- since it takes the age of the universe for light to cross the universe. Peering at distant objects, therefore, tells us about how the universe used to be, even near its beginning. Since telescopes are therefore also time portals, observations of distant clusters can be used, for example, to investigate when and how these huge galaxy conglomerations formed. Previously, the redshift record for a galaxy cluster was about 1.5, corresponding to about nine billion light years distant. Recently, using data including X-ray images from the orbiting Chandra X-Ray Observatory, a new farthest cluster was identified. 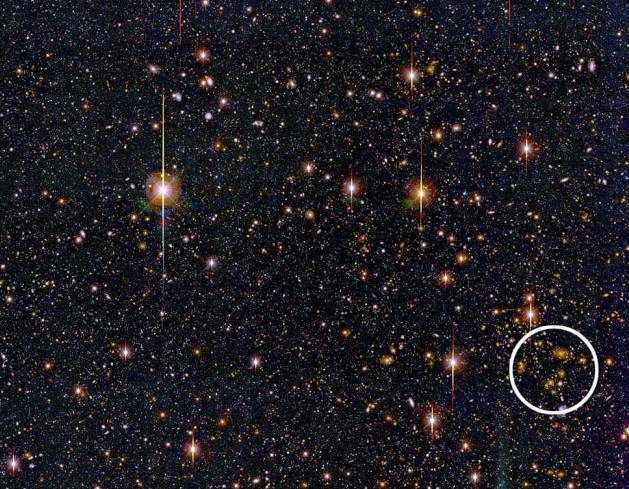 Shown above, JKCS041 is seen at redshift 1.9, corresponding to nearly one billion light years farther than the previous record holder. 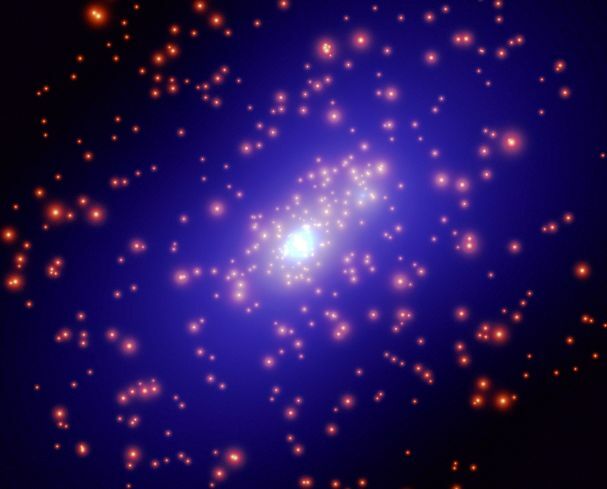 The hot X-ray gas that confirmed the apparent galaxy grouping as a true cluster of galaxies is shown above in diffuse blue, superposed on an optical image showing many foreground stars. 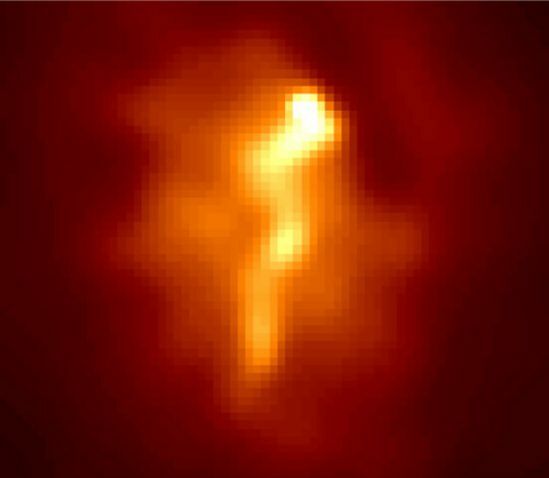 JKCS041 is seen today as it appeared at only one quarter of the present age of the universe. What is that strange arc? 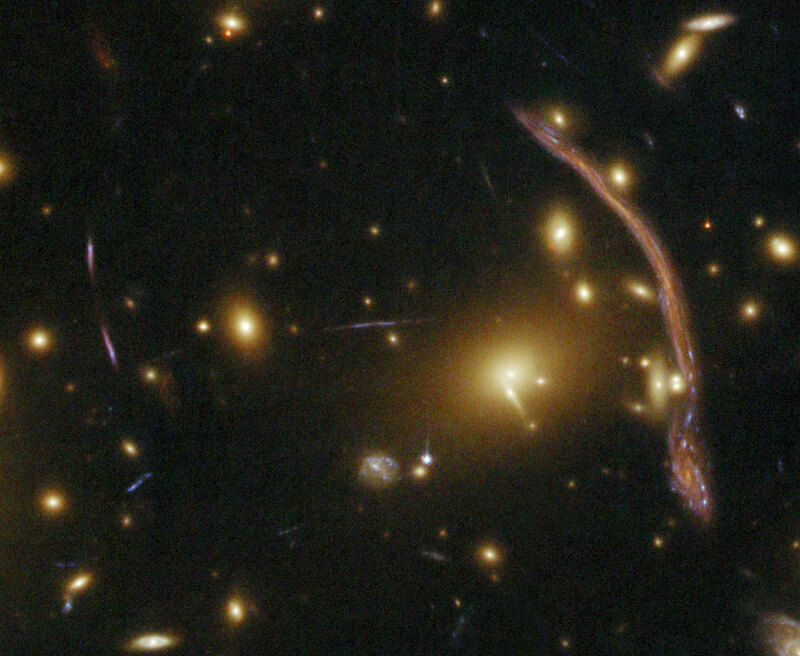 While imaging the cluster of galaxies Abell 370, astronomers had noted an unusual arc to the right of many cluster galaxies. Although curious, one initial response was to avoid commenting on the arc because nothing like it had ever been noted before. In the mid-1980s, however, better images allowed astronomers to identify the arc as a prototype of a new kind of astrophysical phenomenon -- the gravitational lens effect of entire cluster of galaxies on background galaxies. Today, we know that this arc actually consists of two distorted images of a fairly normal galaxy that happened to lie far behind the huge cluster. Abell 370's gravity caused the background galaxies' light -- and others -- to spread out and come to the observer along multiple paths, not unlike a distant light appears through the stem of a wine glass. 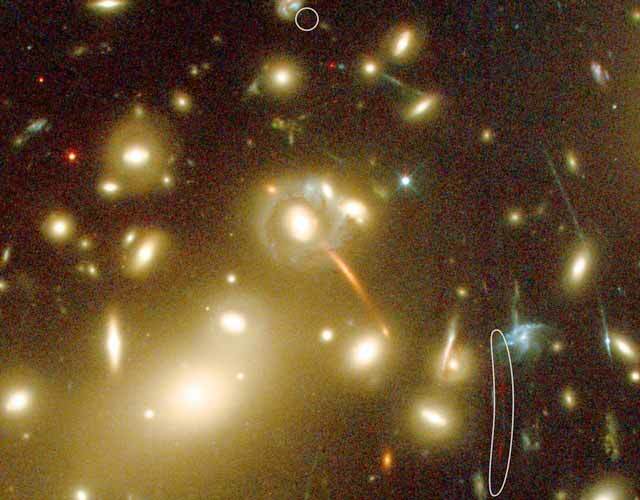 In mid-July, astronomers used the just-upgraded Hubble Space Telescope to image Abell 370 and its gravitational lens images in unprecedented detail. 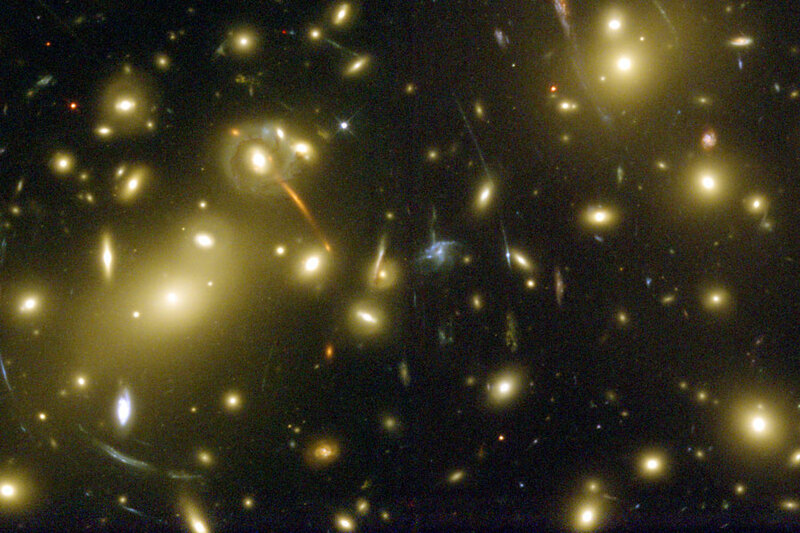 Almost all of the yellow images pictured above are galaxies in the Abell 370 cluster. An astute eye can pick up many strange arcs and distorted arclets, however, that are actually images of more distant galaxies. 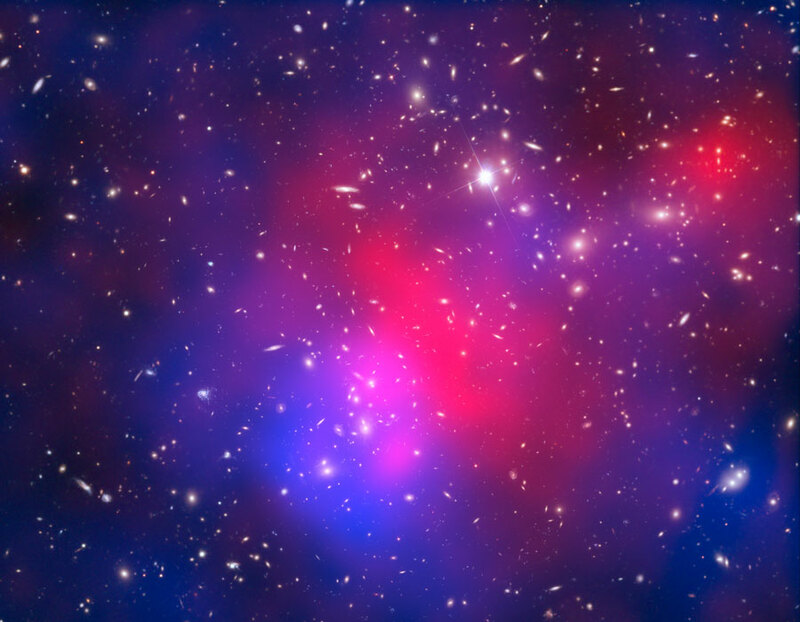 Studying Abell 370 and its images gives astronomers a unique window into the distribution of normal and dark matter in galaxy clusters and the universe. 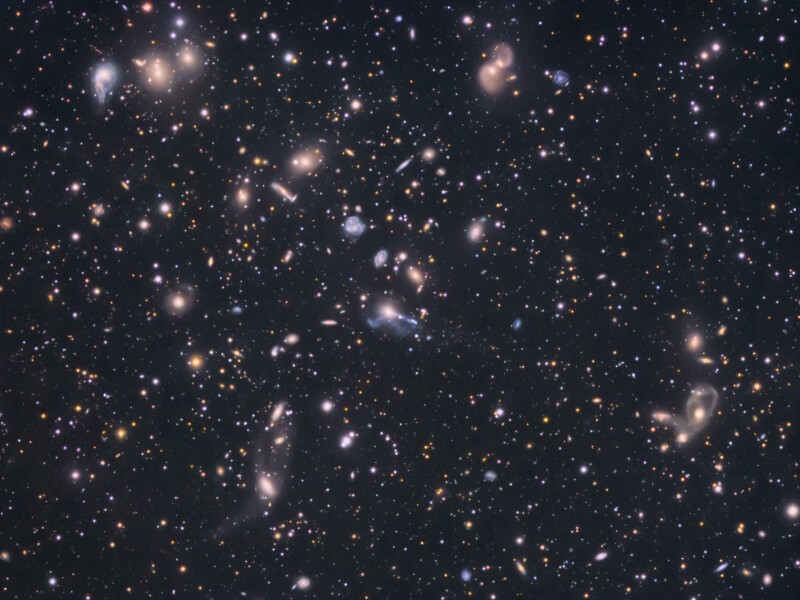 These are galaxies of the Hercules Cluster, an archipelago of island universes a mere 500 million light-years away. Also known as Abell 2151, this cluster is loaded with gas and dust rich, star-forming spiral galaxies but has relatively few elliptical galaxies, which lack gas and dust and the associated newborn stars. The colors in this remarkably deep composite image clearly show the star forming galaxies with a blue tint and galaxies with older stellar populations with a yellowish cast. 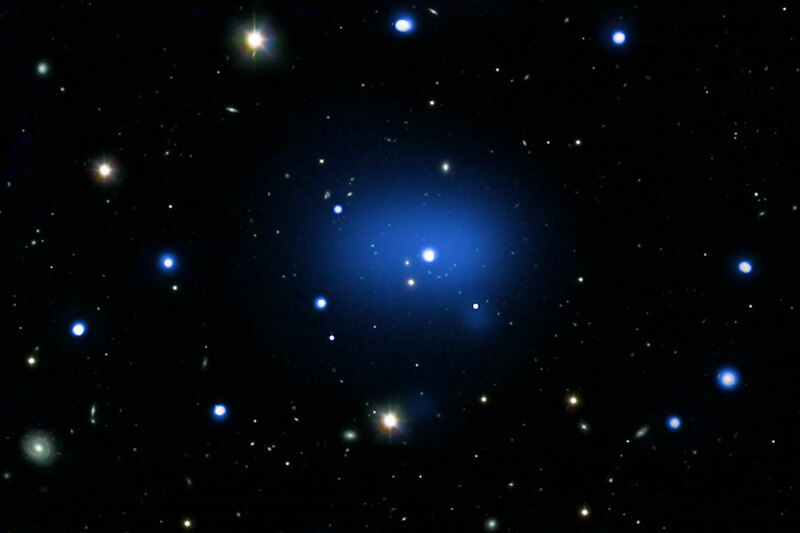 The sharp picture spans about 3/4 degree across the cluster center, corresponding to over 6 million light-years at the cluster's estimated distance. In the cosmic vista many galaxies seem to be colliding or merging while others seem distorted - clear evidence that cluster galaxies commonly interact. 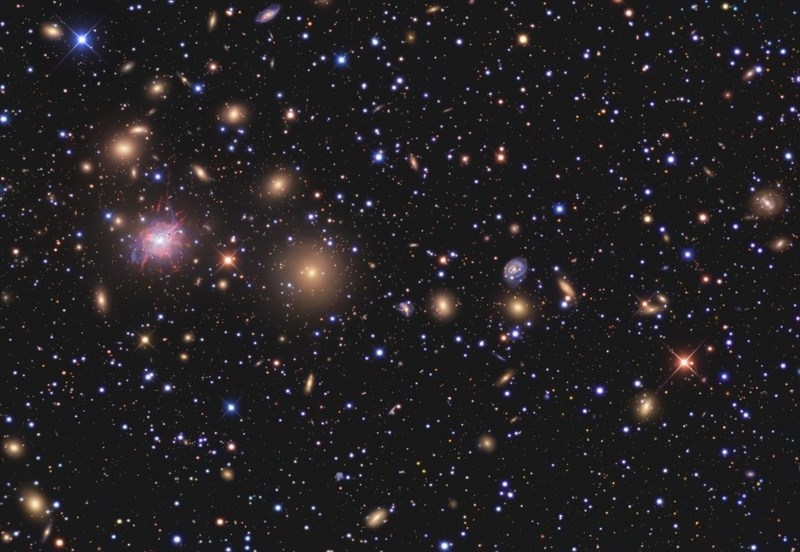 In fact, the Hercules Cluster itself may be seen as the result of ongoing mergers of smaller galaxy clusters and is thought to be similar to young galaxy clusters in the much more distant, early Universe. Almost every object in the above photograph is a galaxy. 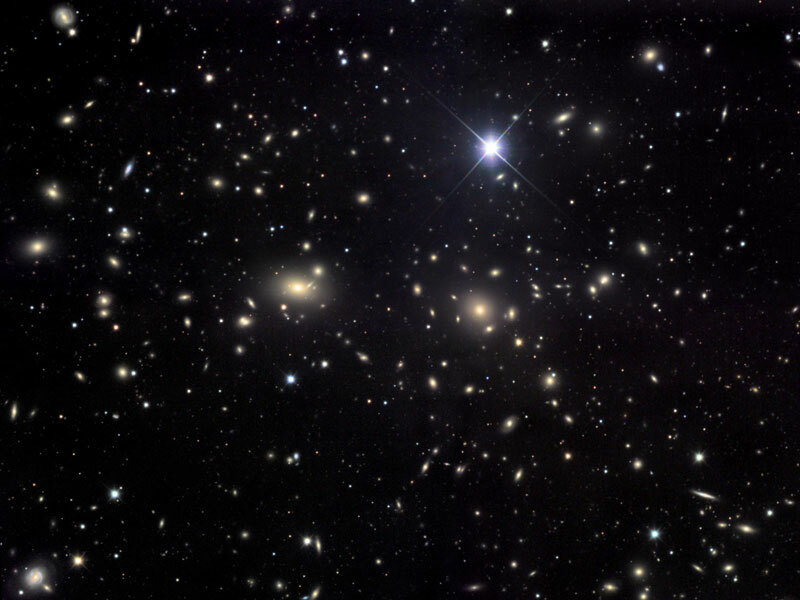 The Coma Cluster of Galaxies pictured above is one of the densest clusters known - it contains thousands of galaxies. Each of these galaxies houses billions of stars - just as our own Milky Way Galaxy does. Although nearby when compared to most other clusters, light from the Coma Cluster still takes hundreds of millions of years to reach us. In fact, the Coma Cluster is so big it takes light millions of years just to go from one side to the other! The above mosaic of images of a small portion of Coma was taken in unprecedented detail by the Hubble Space Telescope to investigate how galaxies in rich clusters form and evolve. 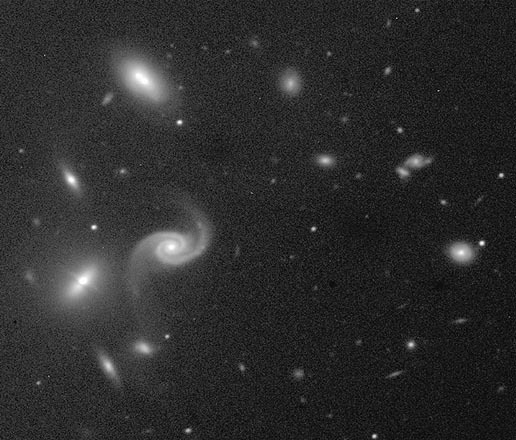 Most galaxies in Coma and other clusters are ellipticals, although some imaged here are clearly spirals. The spiral galaxy on the upper left of the above image can also be found as one of the bluer galaxies on the upper left of this wider field image. In the background thousands of unrelated galaxies are visible far across the universe. Here is one of the largest objects that anyone will ever see on the sky. Each of these fuzzy blobs is a galaxy, together making up the Perseus Cluster, one of the closest clusters of galaxies. The cluster is seen through a foreground of faint stars in our own Milky Way Galaxy. 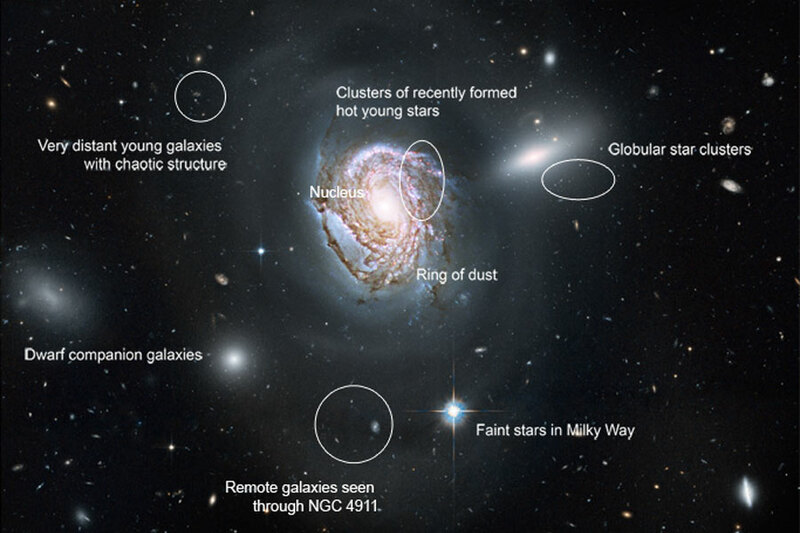 Near the cluster center, roughly 250 million light-years away, is the cluster's dominant galaxy NGC 1275, seen above as the large galaxy on the image left. A prodigious source of x-rays and radio emission, NGC 1275 accretes matter as gas and galaxies fall into it. The Perseus Cluster of Galaxies is part of the Pisces-Perseus supercluster spanning over 15 degrees and containing over 1,000 galaxies. At the distance of NGC 1275, this view covers about 7.5 million light-years. 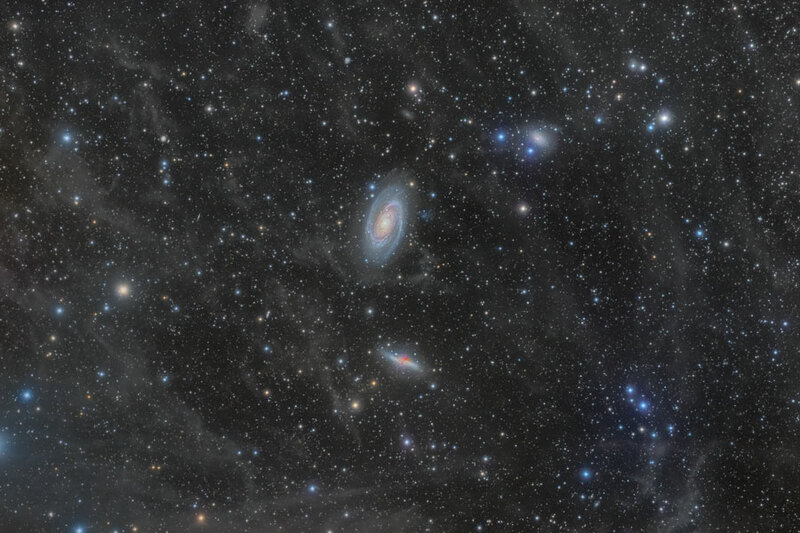 Large galaxies and faint nebulae highlight this deep image of the M81 Group of galaxies. First and foremost in the wide-angle 12-hour exposure is the grand design spiral galaxy M81, the largest galaxy visible in the image. M81 is gravitationally interacting with M82 just below it, a big galaxy with an unusual halo of filamentary red-glowing gas. Around the image many other galaxies from the M81 Group of galaxies can be seen. 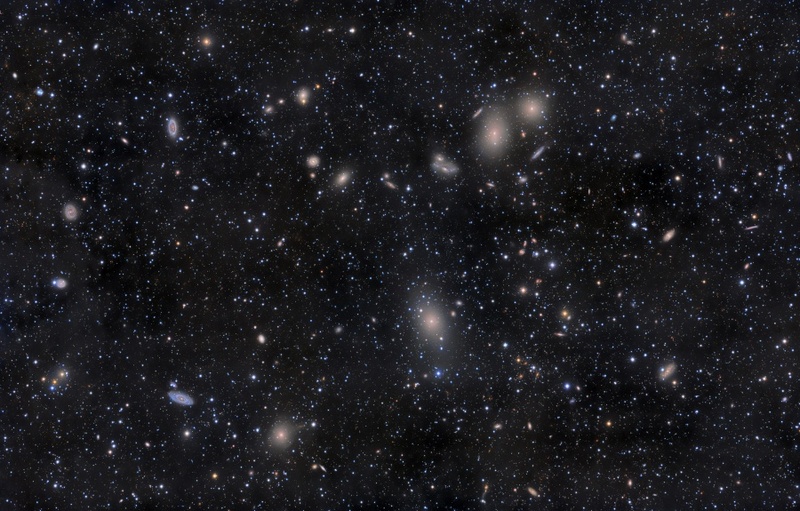 Together with other galaxy congregates including our Local Group of galaxies and the Virgo Cluster of galaxies, the M81 Group is part of the expansive Virgo Supercluster of Galaxies. This whole galaxy menagerie is seen through the faint glow of an Integrated Flux Nebula, a little studied complex of diffuse gas and dust clouds in our Milky Way Galaxy. Gravity can bend light, allowing huge clusters of galaxies to act as telescopes. Almost all of the bright objects in this Hubble Space Telescope image are galaxies in the cluster known as Abell 2218. The cluster is so massive and so compact that its gravity bends and focuses the light from galaxies that lie behind it. As a result, multiple images of these background galaxies are distorted into long faint arcs -- a simple lensing effect analogous to viewing distant street lamps through a glass of wine. 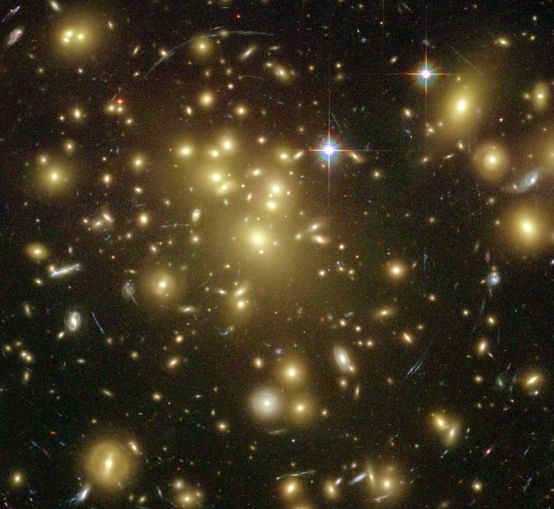 The cluster of galaxies Abell 2218 is itself about three billion light-years away in the northern constellation of the Dragon (Draco). The power of this massive cluster telescope has allowed astronomers to detect a galaxy at redshift 5.58, the most distant galaxy yet measured. This young, still-maturing galaxy is faintly visible to the lower right of the cluster core. 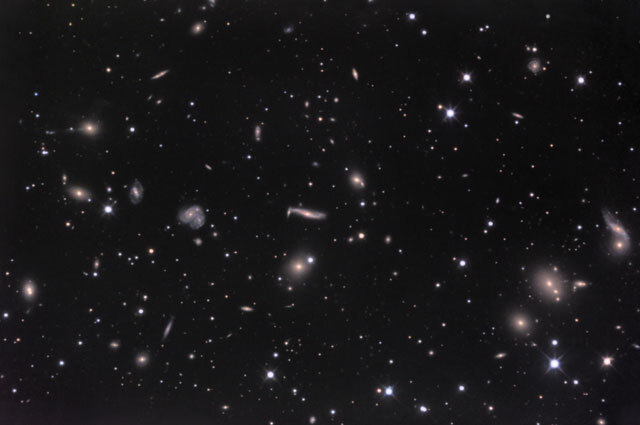 In visible light images, over a thousand galaxies are seen to lie within a volume about 20 million light-years across in the rich Coma Galaxy Cluster. 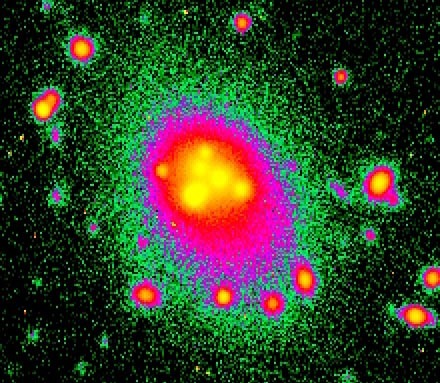 But infrared images of the Coma Cluster have now been used to add thousands more to the Coma's galaxy count in the form of previously undiscovered dwarf galaxies. This composite combines infrared Spitzer Space Telescope image data (red and green) with visible light Sloan Sky Survey data (blue) for the central part of the cluster. 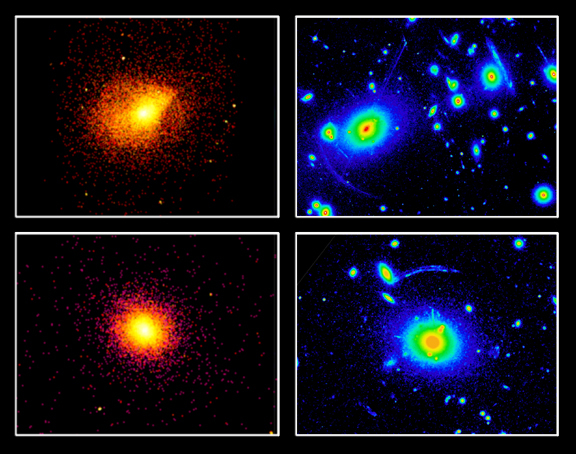 Over 1 degree wide, the field is dominated by two giant elliptical galaxies in blue. Still, many of the small green smudges (see magnified inset) are identified as dwarf galaxies, roughly comparable to the Small Magellanic Cloud. Dwarf galaxies are thought to form first, providing building blocks for larger galaxies. The well-studied, friendly, Coma Cluster is 320 million light-years away. How do we know that dark matter isn't just normal matter exhibiting strange gravity? A new observation of gravitationally magnified faint galaxies far in the distance behind a massive cluster of galaxies is shedding new dark on the subject. The above detailed image from the Hubble Space Telescope indicates that a huge ring of dark matter likely exists surrounding the center of CL0024+17 that has no normal matter counterpart. What is visible in the above image, first and foremost, are many spectacular galaxies that are part of CL0024+17 itself, typically appearing tan in color. 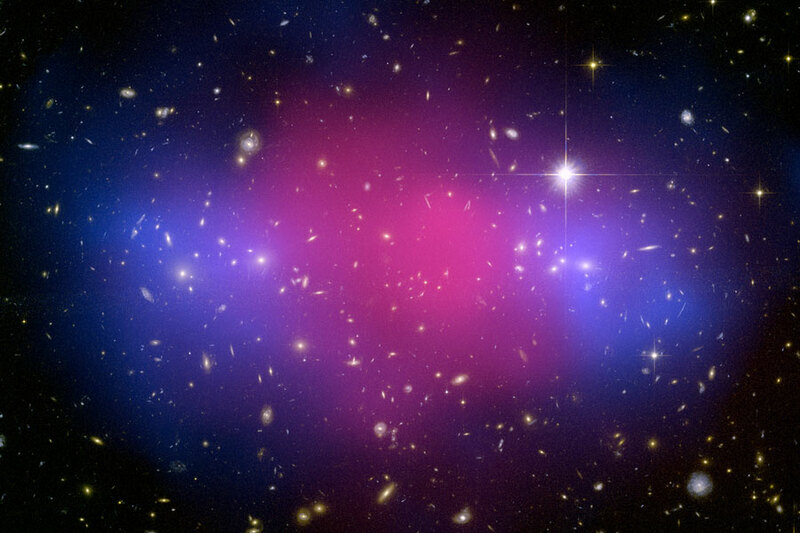 Next, a close inspection of the cluster center shows several unusual and repeated galaxy shapes, typically more blue. 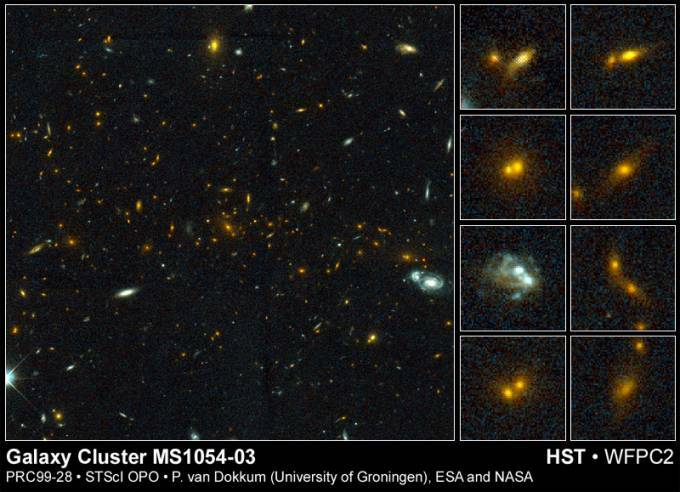 These are multiple images of a few distant galaxies, showing that the cluster is a strong gravitational lens. 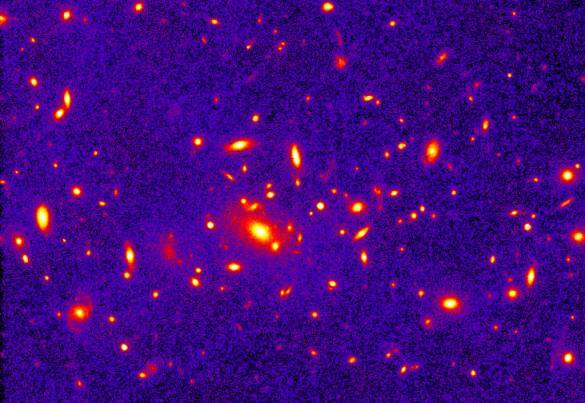 It is the relatively weak distortions of the many distant faint blue galaxies all over the image, however, that indicates the existence of the dark matter ring. 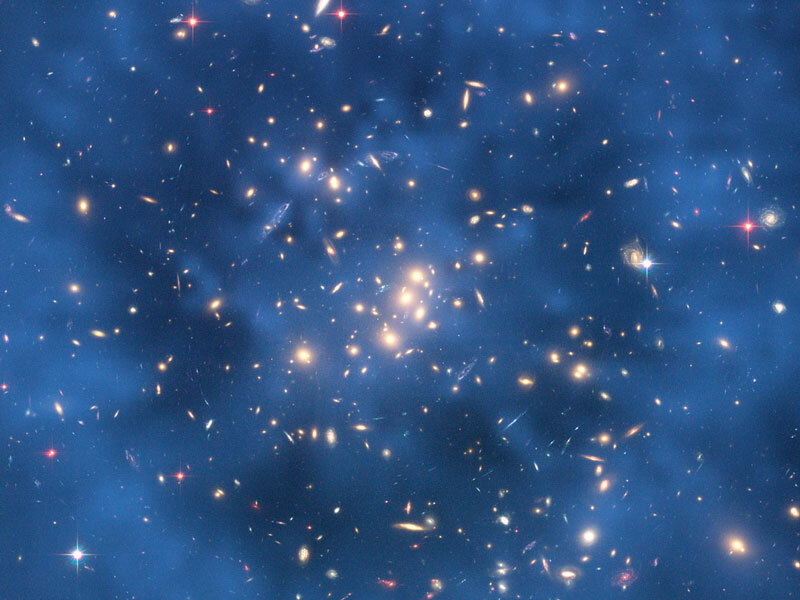 The computationally modeled dark matter ring spans about five million light years and been digitally superimposed to the image in diffuse blue. A hypothesis for the formation of the huge dark matter ring holds that it is a transient feature formed when galaxy cluster CL0024+17 collided with another cluster of galaxies about one billion years ago, leaving a ring similar to when a rock is thrown in a pond. Credit: NASA, ESA, Jean-Paul Kneib (Laboratoire d’Astrophysique de Marseille) et al. 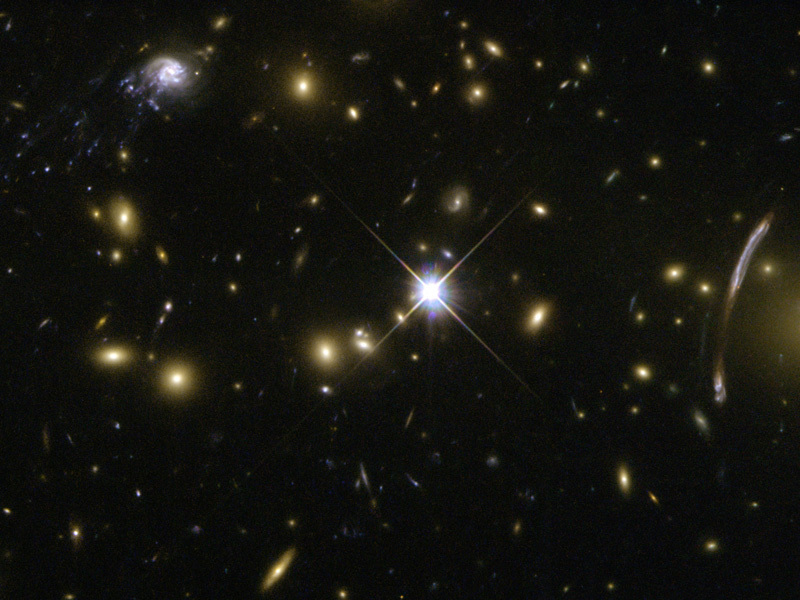 What's happening to the galaxies of cluster Abell 2667? On the upper left, a galaxy appears to be breaking up into small pieces, while on the far right, another galaxy appears to be stretched like taffy. 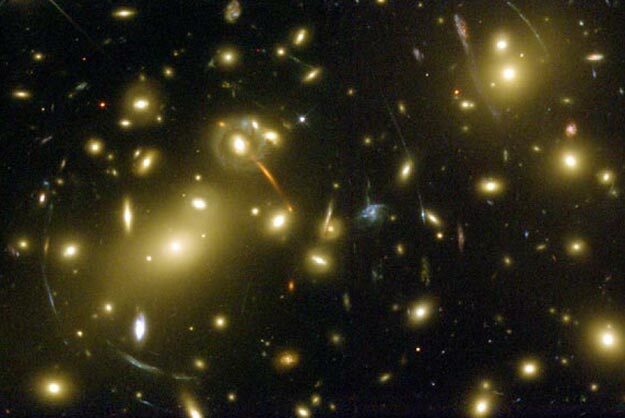 To start, most of the yellowish objects in the above image from the Hubble Space Telescope are galactic members of a massive cluster of galaxies known as Abell 2667. The distortion of the galaxy on the upper left is real. As the galaxy plows through the intercluster medium, gas is stripped out and condenses to form bright new knots of stars. This detailed image of ram pressure stripping helps astronomers understand why so many galaxies today have so little gas. The distortion of the galaxy on the far right, however, is an illusion. This nearly normal galaxy is actually far behind the massive galaxy cluster. Light from this galaxy is gravitationally lensed by Abell 2667, appearing much like a distant person would appear through a wine glass. Each distorted galaxy gives important clues about how galaxies and clusters of galaxies evolve. 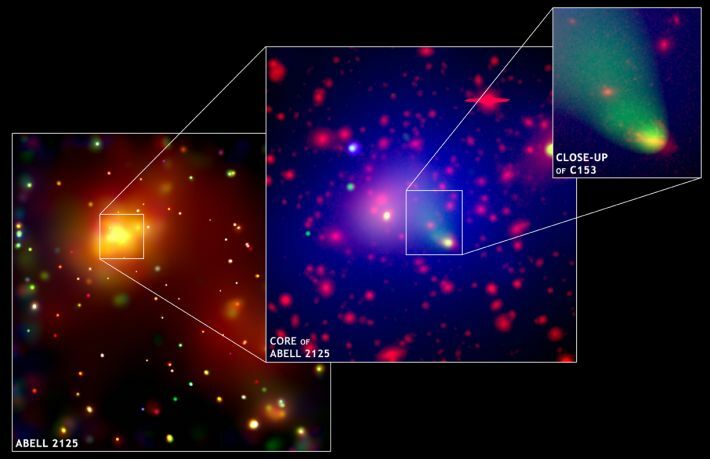 What's happening near the center of this cluster of galaxies? At first glance, it appears that several strangely elongated galaxies and fully five bright quasars exist there. 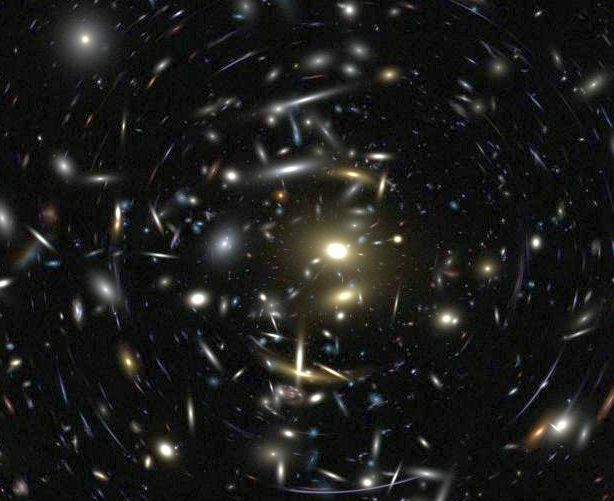 In reality, an entire cluster of galaxies is acting as a gigantic gravitational lens that distorts and multiply-images bright objects that occur far in the distance. The five bright white points near the cluster center are actually images of a single distant quasar. This Hubble Space Telescope image is so detailed that even the host galaxy surrounding the quasar is visible. Close inspection of the above image will reveal that the arced galaxies at 2 and 4 o'clock are actually gravitationally lensed images of the same galaxy. A third image of that galaxy can be found at about 10 o'clock from the cluster center. Serendipitously, numerous strange and distant galaxies dot the above image like colorful jewels. 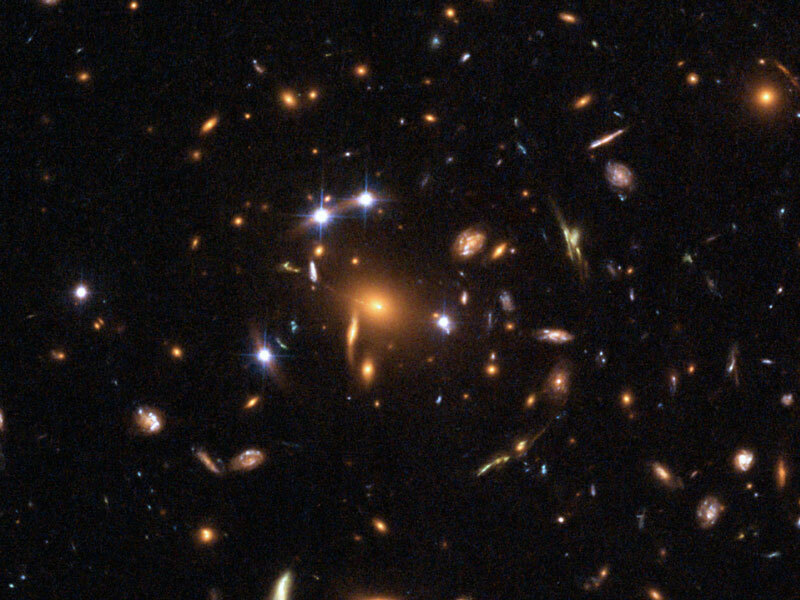 The cluster of galaxy that acts as the huge gravitational lens is cataloged as SDSS J1004+4112 and lies about 7 billion light years distant toward the constellation of Leo Minor. The Perseus Cluster of thousands of galaxies, 250 million light-years distant, is one of the most massive objects in the Universe and the brightest galaxy cluster in the x-ray sky. At its core lies the giant cannibal galaxy Perseus A (NGC 1275), accreting matter as gas and galaxies fall into it. 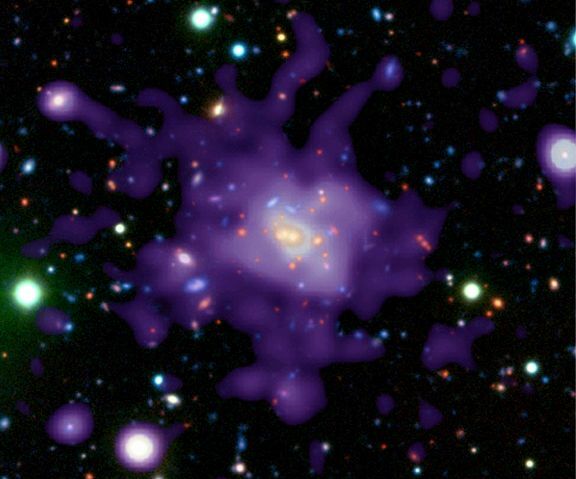 This deep Chandra Observatory x-ray image spans about 300,000 light-years across the galaxy cluster core. It shows remarkable details of x-ray emission from the monster galaxy and surrounding hot (30-70 million degrees C) cluster gas. 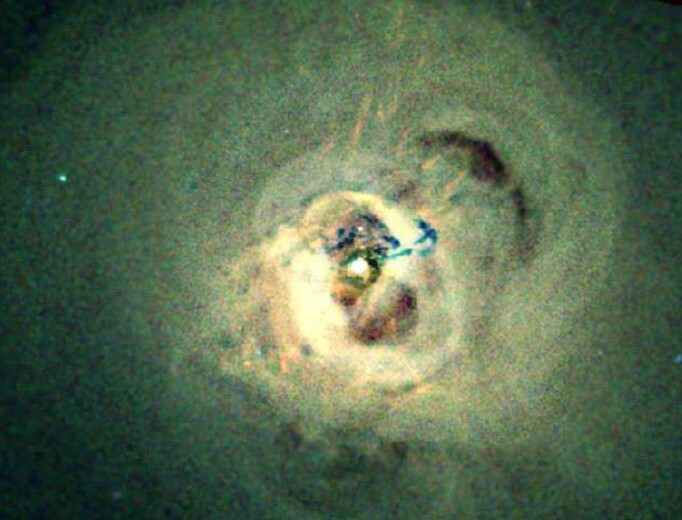 The bright central source is the supermassive black hole at the core of Perseus A itself. Low density regions are seen as dark bubbles or voids, believed to be generated by cyclic outbursts of activity from the central black hole. The activity creates pressure waves - sound waves on a cosmic scale- that ripple through the x-ray hot gas. Dramatically, the blue-green wisps just above centre in the false-color view are likely x-ray shadows of the remains of a small galaxy falling into the burgeoning Perseus A. How do huge clusters of galaxies evolve? To help find out, astronomers pointed the wide-angle Burrell-Schmidt telescope on Kitt Peak National Observatory in Arizona, USA at the nearby Virgo Cluster of Galaxies. After hundreds of 15-minute exposures taken over two months in early 2004, the result is a dramatically deep and wide angle image of Virgo, the closest cluster of galaxies to our Milky Way Galaxy. Bright foreground stars have been digitally removed from the image but are still represented by numerous unusual dark spots. 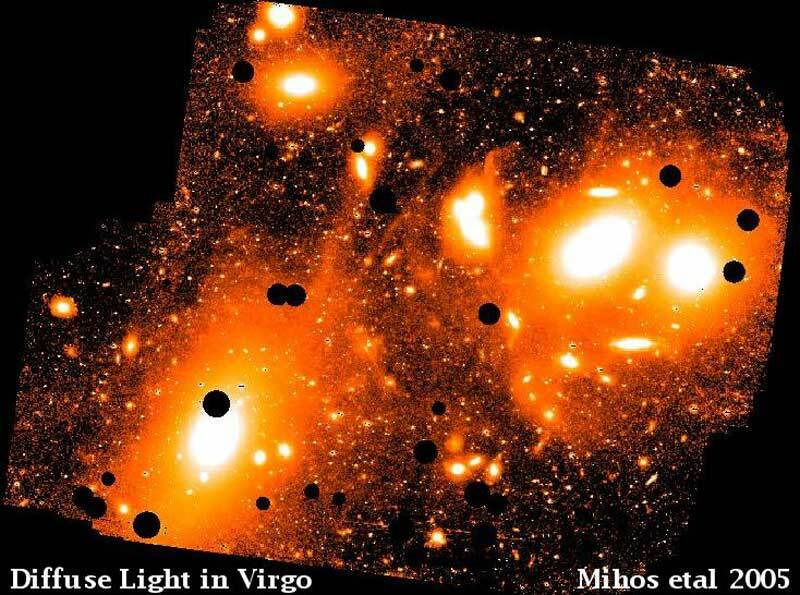 Inspection of the above image shows unusually large halos for the brightest galaxies as well as unusual faint streams of stars connecting Virgo galaxies that previously appeared unrelated. 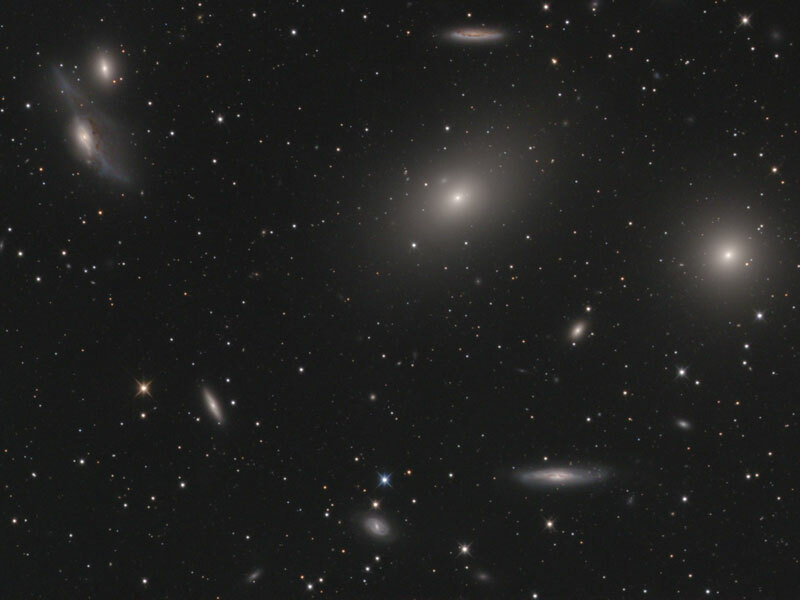 The above image allows a better reconstruction of the past few billion years of the gigantic Virgo cluster and illuminates the dynamics of clusters of galaxies in general. A comet-like tail of glowing gas, 200,000 light-years long, streams from galaxy C153 as it plunges through galaxy cluster Abell 2125 at nearly 8 million kilometers per hour. Itself a member of the giant cluster of galaxies, C153 may once have been a spiral galaxy like the Milky Way. But this remarkable series of images, false-color composites of x-ray and optical data, zooms in on the galaxy's fate. A headlong passage through the hot intracluster gas in the central regions of Abell 2125 is seen to be stripping C153 of its own star forming material and distorting its shape. As other galaxies in the cluster suffer a similar fate, the hot gas collecting in the cluster's core should become enriched in heavy elements. The violent spectacle was taking place about 3 billion light-years from Earth and is thought to illustrate a common process in the cosmic evolution of large clusters of galaxies. Long before medieval alchemists dreamed of transmuting base metals to gold, stellar furnaces in this massive cluster of galaxies - cataloged as RDCS 1252.9-2927 - had transformed light elements into heavy ones. 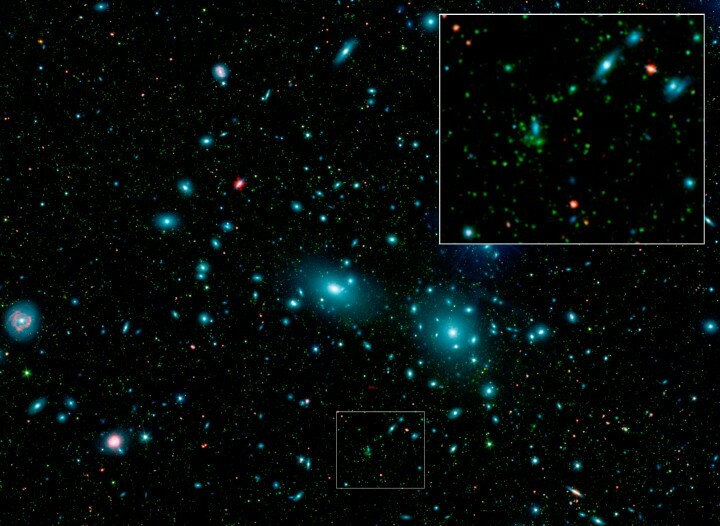 In the false-color composite image individual cluster galaxies can be seen at optical and near-infrared wavelengths, shown in red, yellow, and green colors. X-ray data (in purple) reveal the hot intracluster gas, enriched in heavy elements. Attracting the attention of astronomers using the orbiting Chandra and XMM-Newton x-ray telescopes, as well as the Hubble Space Telescope and ground based VLT, the galaxy cluster lies nearly 9 billion light-years away ... and so existed at a time when the Universe was less than 5 billion years old. A measured mass of more than 200 trillion Suns makes this galaxy cluster the most massive object ever found when the Universe was so young. The cluster elemental abundances are consistent with the idea that most heavy elements were synthesized early on by massive stars, but current theories suggest that such a massive cluster should be rare in the early Universe. Gravity can bend light, allowing whole clusters of galaxies to act as huge telescopes. Almost all of the bright objects in this just-released Hubble Space Telescope image are galaxies in the cluster known as Abell 2218. The cluster is so massive and so compact that its gravity bends and focuses the light from galaxies that lie behind it. As a result, multiple images of these background galaxies are distorted into long faint arcs - a simple lensing effect analogous to viewing distant street lamps through a glass of wine. 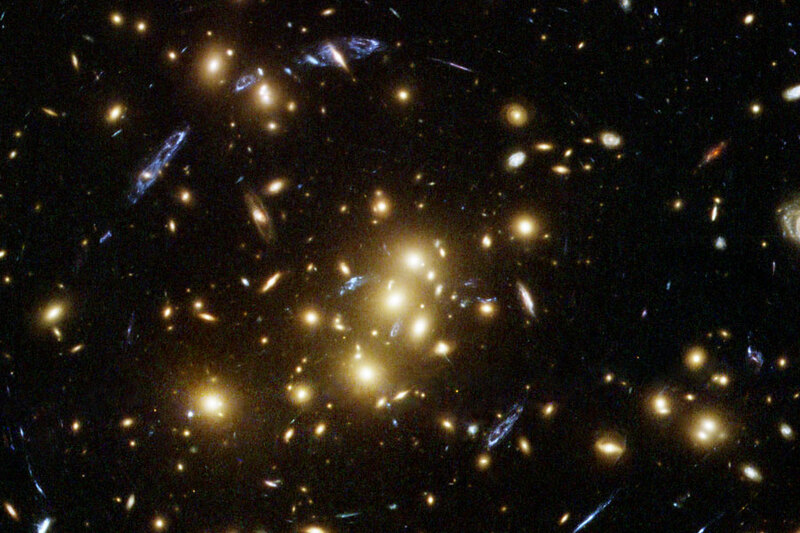 The cluster of galaxies Abell 2218 is itself about two billion light-years away in the northern constellation Draco. The power of this massive cluster telescope has recently allowed astronomers to detect a galaxy at a redshift of about 7, the most distant galaxy or quasar yet measured. Three images of this young, still-maturing galaxy are faintly visible in the white contours near the image top and the lower right. The recorded light, further analyzed with a Keck Telescope, left this galaxy when the universe was only about five percent of its current age. The Centaurus Cluster is a swarm of hundreds of galaxies a mere 170 million light-years away. Like other immense galaxy clusters, the Centaurus Cluster is filled with gas at temperatures of 10 million degrees or more, making the cluster a luminous source of cosmic x-rays. While individual galaxies are not seen here, this false-color x-ray image from the Chandra Observatory does reveal striking details of the central region's hot cluster gas, including a large twisted plume about 70,000 light-years long. Colors represent temperatures indicated by the x-ray data with red, yellow, green, and blue shades ranging in order from cool to hot. The plume of gas alone is estimated to contain material equivalent to about one billion times the mass of the Sun. It may be a wake of gas condensing and cooling along the path of the massive, dominant central galaxy moving through the cluster. Stunningly detailed, this picture is a computer simulated view of a cluster of galaxies in the distant cosmos. A large, elliptical galaxy dominates this hypothetical cluster's central region surrounded by a swarm of member galaxies. 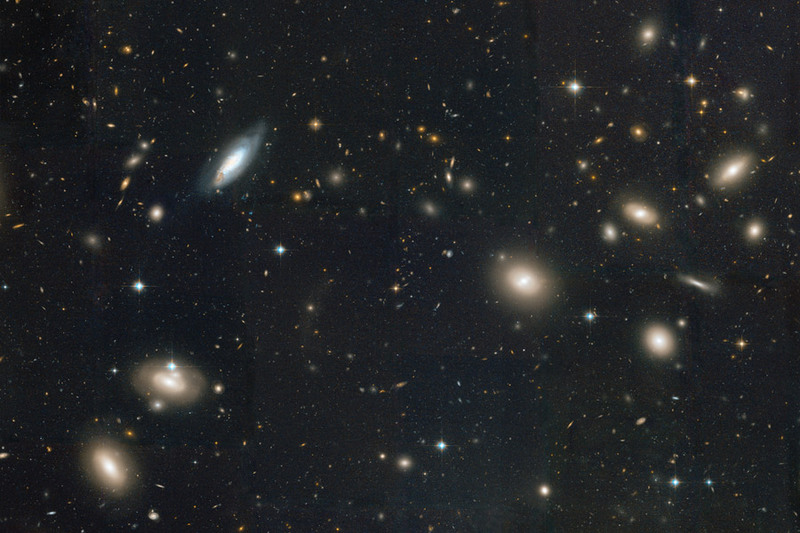 Other galaxies which lie far behind the cluster are seen as numerous visible concentric arcs - lensed by the enormous gravitational field dominated by dark matter within the cluster itself. Such magnificent images are expected to be achieved by the Advanced Camera for Surveys (ACS), one of the upgrades being installed on the Hubble Space Telescope during the ongoing servicing mission. Compared to Hubble's workhorse Wide Field Planetary Camera 2 (WFPC2), whose achievements include the current deep field views of the Universe, the new technology ACS will be twice as sharp an imager with twice the field of view and five times the sensitivity. Along with extended views of the distant cosmos, enthusiastic astronomers also plan to use the ACS to monitor our own Solar System and to search for planets orbiting stars beyond the Sun. 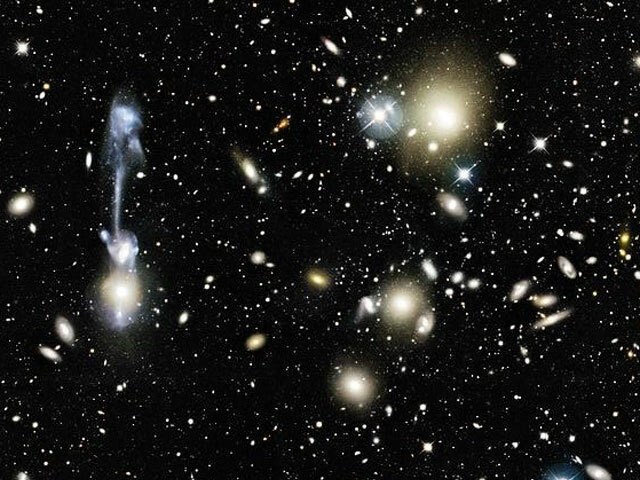 Typical of large galaxy clusters billions of light-years away, Abell 2597 features hundreds of galaxies embedded in a cloud of multimillion degree gas which glows in x-rays. 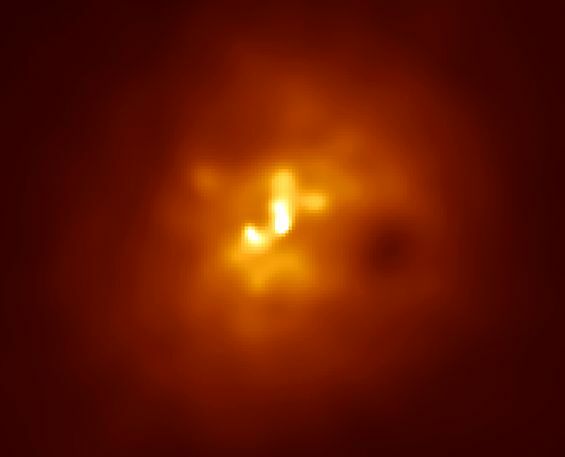 This Chandra Observatory x-ray image shows the hot gas in this cluster's central regions and also reveals two large dark cavities within the x-ray glow; one below and right of center, the other above and left. Not a comment on dental health, Abell 2597's cavities are about 60,000 light-years across. They are thought to be remnants of a 100 million year old explosion originating from a supermassive black hole at the cluster's core. But the dim ghost cavities are not completely empty or they would have collapsed long ago. Instead they are likely filled with hotter gas, high energy particles, and magnetic fields and are moving away from the cluster center, like bubbles rising in champagne. Over the life of a galaxy cluster such explosions may happen over and over, creating a series of cavities which transport magnetic fields away from the cluster center. In fact, radio observations suggest another explosion has since occurred in the center of Abell 2597. Situated over 2,000,000,000 (two billion) light-years from Earth, galaxies in cluster Abell 2390 (top) and MS2137.3-2353 (bottom) are seen in the right hand panels above, false-color images from the Hubble Space Telescope. 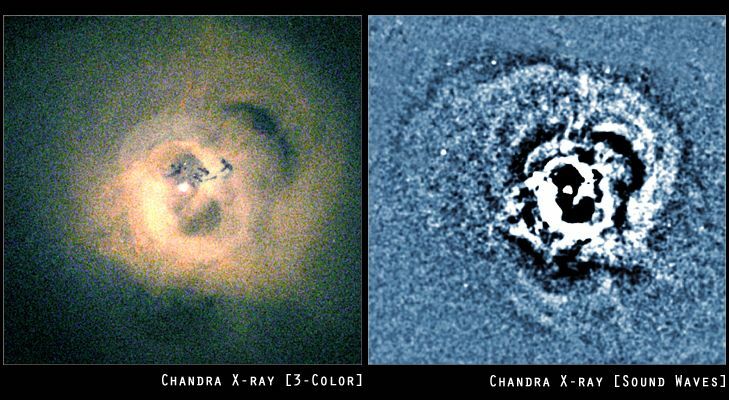 Corresponding panels on the left reveal each cluster's x-ray appearance in images from the Chandra X-ray Observatory. While the Hubble images record the cluster's star-filled galaxies, the x-ray images show no galaxies at all ... only multi-million degree hot intracluster gas which glows in high energy x-rays. But there lies a profound mystery. The total mass in the galaxies on the right, plus the mass of the hot gas on the left, falls far short of providing enough gravity to confine the hot gas within the galaxy clusters. In fact, the best accounting to date can only find 13 per cent (!) of the total matter necessary. 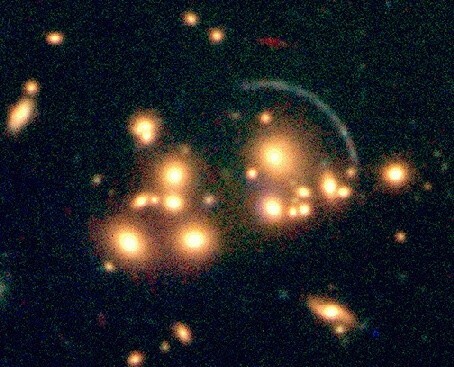 Gravitational lens arcs visible in the deep Hubble images also indicate these clusters have much more mass than directly identifiable in the Chandra and Hubble data. Astronomers conclude that most of the cluster matter is dark matter, invisible even to the combined far-seeing eyes of these orbiting astrophysical observatories. 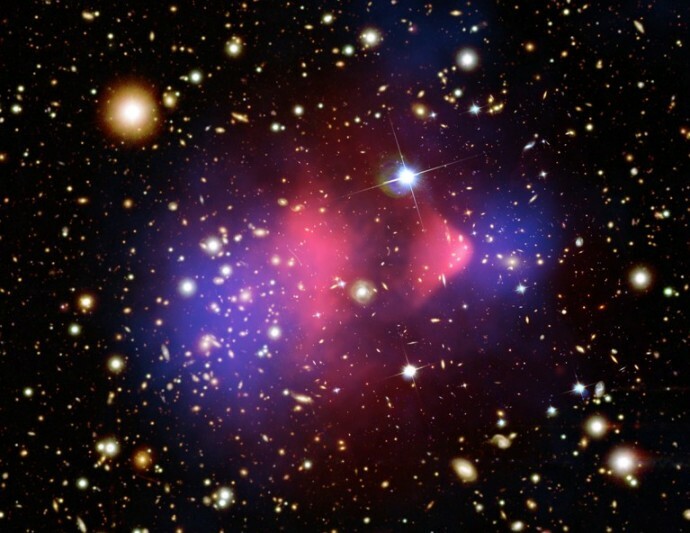 What is the nature of this cosmic dark matter? Gravity can bend light, allowing huge clusters of galaxies to act as telescopes. Almost all of the bright objects in this released Hubble Space Telescope image are galaxies in the cluster known as Abell 2218. The cluster is so massive and so compact that its gravity bends and focuses the light from galaxies that lie behind it. As a result, multiple images of these background galaxies are distorted into long faint arcs - a simple lensing effect analogous to viewing distant street lamps through a glass of wine. 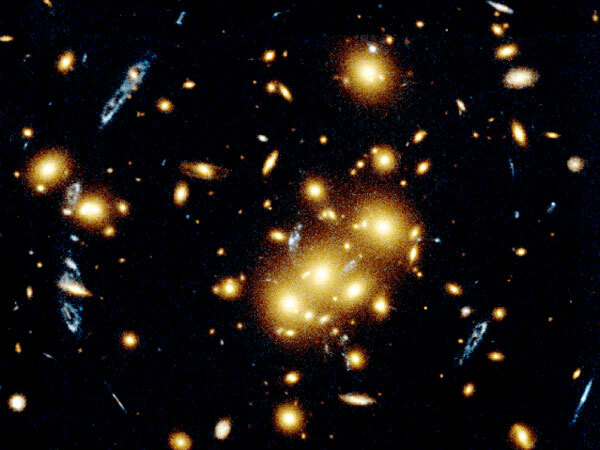 The cluster of galaxies Abell 2218 is itself about three billion light-years away in the northern constellation Draco. The power of this massive cluster telescope has recently allowed astronomers to detect a galaxy at redshift 5.58, the most distant galaxy yet measured. This young, still-maturing galaxy is faintly visible to the lower right of the cluster core. Throughout the Universe, galaxies tend to swarm in groups ranging from just a handful of members to casts of thousands. Astronomers have realized since the early 1970s that the larger swarms, immense clusters of galaxies millions of light-years across, are immersed within tenuous clouds of hot gas which glow strongly in x-rays. These clouds may have been heated by their collapse in the early Universe, but in many galaxy clusters, the gas appears to be cooling. This Chandra Observatory x-ray image reveals a striking cooling flow in the central regions of the galaxy cluster cataloged as Abell 1795. Brighter pixels in the false-color image represent higher x-ray intensities. The bright filament down the center indicates gas condensing and cooling -- rapidly loosing energy by radiating x-rays. At the very top of the filament is a large, x-ray bright galaxy. As it moved through the cluster gas cloud, the massive galaxy's gravitational influence seems to have created this cosmic wake of denser, cooling gas. Continuing to cool, the cluster gas will ultimately provide raw material to form future generations of stars. This haunting image from the orbiting Chandra Observatory reveals the Perseus Cluster of Galaxies in x-rays, photons with a thousand or more times the energy of visible light. Three hundred twenty million light-years distant, the Perseus Cluster contains thousands of galaxies, but none of them are seen here. Instead of mere galaxies, a fifty million degree cloud of intracluster gas, itself more massive than all the cluster's galaxies combined, dominates the x-ray view. From this angle, voids and bright knots in the x-ray hot gas cloud lend it a very suggestive appearance. 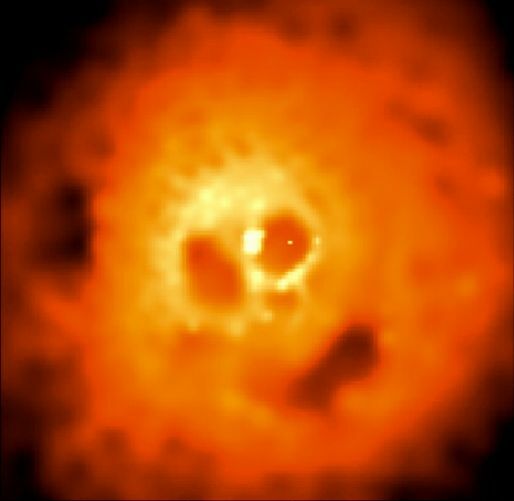 Like eyes in a skull, two dark bubbles flank a bright central source of x-ray emission. A third elongated bubble (at about 5 o'clock) forms a toothless mouth. 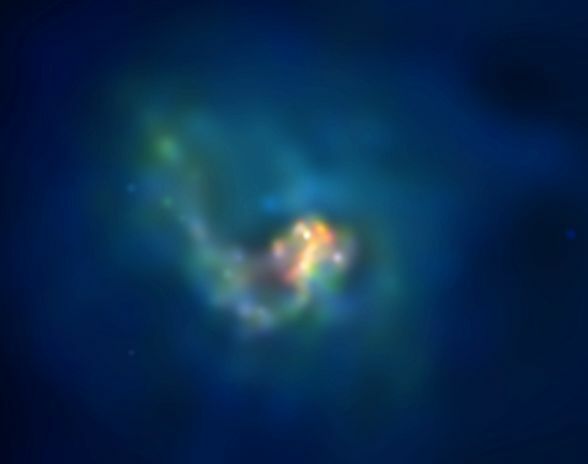 The bright x-ray source is likely a supermassive black hole at the cluster center with the bubbles blown by explosions of energetic particles ejected from the black hole and expanding into the immense gas cloud. Fittingly, the dark spot forming the skull's "nose" is an x-ray shadow ... the shadow of a large galaxy inexorably falling into the cluster center. Over a hundred thousand light-years across, the Perseus Cluster's x-ray skull is a bit larger than skulls you may see tonight. Have a safe and happy Halloween! Hundreds of galaxies appear as faint smudges of light in this Hubble Space Telescope picture of galaxy cluster MS1054-03. Eight billion light-years away, the cluster is among the most distant known clusters of galaxies and is now reported to contain the largest number of colliding galaxies ever found in a cluster. Examples of these truly cosmic collisions are shown in the insets at the right. Disrupted by gravitational effects, the colliding galaxies are thought to merge over a billion years or so to form larger galaxies - a theory of galaxy formation which seems to be borne out by these results. Though galaxy collisions appear to have occurred much more frequently in the distant, early Universe, they are still seen to happen in the nearby, "close-to-present" Universe. It is difficult to hide a galaxy behind a cluster of galaxies. The closer cluster's gravity will act like a huge lens, pulling images of the distant galaxy around the sides and greatly distorting them. This is just the case observed in the above recently released image from the VLT. The cluster CL2244-02 is composed of many yellow galaxies and is lensing the image of a blue-white background galaxy into a huge arc. Careful inspection of the image will reveal at least one other lensed background galaxy appearing in red. 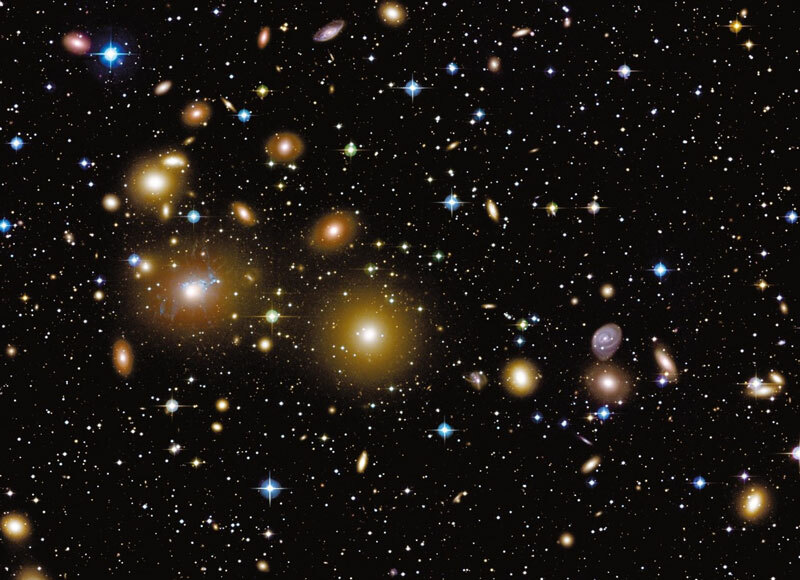 The foreground cluster can only create such a smooth arc if most of its mass is smoothly distributed dark matter - and therefore not concentrated in the yellow galaxies visible. Analyzing these gravitational arcs gives astronomers a method to estimate the dark matter distribution in clusters of galaxies. Far across the universe, an unusual cluster of galaxies has been evolving. A diverse group of galaxies populate this cluster, including, on the left, an unusual galaxy showing an equatorial polar ring and a large spiral. Above looms a large elliptical galaxy. The reason for the small size of galaxies on the right is not yet known - these galaxies might be smaller or might just lie even farther in the distance. Almost every spot in this picture is a galaxy. Studying distant clusters like this may help astronomers better understand when and how these cosmic giants formed. Why is this galaxy cluster so red? Nearby clusters have galaxies with colors that are much more yellow and blue. A leading explanation is that this cluster of galaxies lies so far across our universe (z~1) that cosmological time dilation significantly reddens the light. If true, this cluster might lie too far away to have formed in a dense universe, implying that our universe is not very dense. HST 035528+09435 is one of the reddest clusters found in the Hubble Space Telescope's Medium Deep Survey. Astronomers will now work to confirm the high distance to this cluster, and contemplate what it signifies about the nature of our universe. It was mealtime in galaxy cluster Abell 3827. The hungry cluster dominant galaxy in A3827's center is seen being fed. Breakfast included five smaller galaxies unfortunate enough to wander too close to the cluster's central supergiant galaxy. The remnants of these five galaxies can be seen in the center of this false-color picture. A single massive galaxy dominates the centers of many compact clusters of galaxies. A3827 is so distant, having a redshift of 0.1, that light takes about 1.5 billion years to get here from there. We are therefore seeing this cluster only as it existed 1.5 billion years ago, so that these five galaxies are probably by now all digested into the huge cluster center. But in the topic Coma Cluster of Galaxies the explanation is incomplete. saturno2 wrote: A collection very good! I agree with you that the caption could have said a bit more about the Coma Cluster. Personally I don't know much at all about the Coma Cluster, mostly because it is generally made up of "yellow blobs", elliptical galaxies. So the distance to the Coma Cluster is presumably about 320 light-years. That would make the Coma Cluster about five times as distant as the Virgo Cluster, whose mean distance is, I think, 60 million light-years. But the Coma Cluster is a lot more massive than the Virgo Cluster. Interestingly, even though the Virgo Cluster is comparatively close to us from a cosmic point of view, it is still sufficiently far away that it can't dominate us gravitationally. The expansion of the universe makes us "separate" from the Virgo cluster, even though the mighty gravity of Virgo wants to pull us in. And the even more massive but even more distant Coma is moving away from us at an even greater clip. I think that you are completing the information.